Former Rep. Dan Rostenkowski, the Chicago Democrat who became the leading architect of congressional tax policy in the Reagan era but later went to federal prison for corruption, died Wednesday, a family friend said. He was 82. Rostenkowski, who served 18 terms before losing in 1994, died surrounded by family at his home in Lake Benedict, Wis., friend Ellen Tully told The Associated Press. He died of lung cancer, which was diagnosed last August, Tully said. As House Ways and Means Committee chairman, Rostenkowski was known as a consensus builder and a master of legislative tactics. He is credited with leading a 1983 effort to rescue Social Security from insolvency and pushing through a sweeping 1986 overhaul of the nation's tax system. Friends and colleagues said that despite the corruption scandal -- Rostenkowski pleaded guilty to using office funds for his own use -- he will be best remembered as a master politician who got things done. "He was the go-to guy for (Chicago) mayors," former Secretary of Commerce William Daley said, listing his father, the late Richard J. Daley, and his brother, current Mayor Richard M. Daley. "You didn't go the senators, you went to Danny." Rostenkowski was proud of representing an urban district and saw his job as bringing projects back to Chicago, including major construction projects such as the Kennedy Expressway and the subway between O'Hare International Airport and downtown, William Daley said. But Rostenkowski himself acknowledged that his legacy would always be tainted by his stint in federal prison. "I know that my obituary will say, 'Dan Rostenkowski, felon,' and it is something that I have to live with,"' he said in a 1998 broadcast interview with Robert Novak and Mark Shields. In 2000, however, then-President Bill Clinton pardoned Rostenkowski. Two prominent Republicans, former President Gerald R. Ford and former House Minority Leader Robert H. Michel were among those urging the pardon. Rostenkowski's problems began in 1992 when a grand jury in Washington charged him with 17 counts of misusing government and campaign funds. 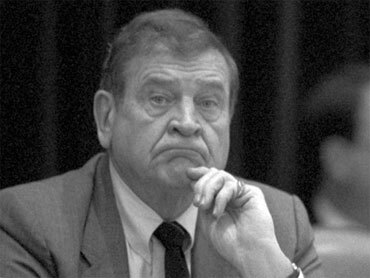 The scandal forced him to step down as chairman and led to his 1994 defeat by Republican unknown Michael Patrick Flanagan, who became the first GOP congressman from Chicago in 35 years. In the end, Rostenkowski pleaded guilty two counts of mail fraud. He admitted in his plea agreement that he had converted office funds to his own use for gifts such as Lenox china and armchairs. He admitted hiring people on his congressional payroll who did little or no official work -- but took care of his lawn, took photographs at political events and family weddings, helped his family's business and supervised the renovation of his house. Even after pleading guilty, Rostenkowski continued to say that what he did should have been counted as a violation of House rules not a crime. Rostenkowski served 17 months in prison, mainly at the federal government's correctional center at Oxford, Wis. After his release, he spoke to a prison reform group and joked about "my Oxford education." Biographer Richard Cohen wrote that Rostenkowski was "among the half dozen most influential members of Congress during the second half of the 20th century." Daniel David Rostenkowski was born Jan. 2, 1928, into one of Chicago's leading Polish-American political families. His father was an alderman. Rostenkowski was educated at St. John's Academy, a Wisconsin military school, and Loyola University in Chicago. He served in the infantry in Korea from 1946 to 1948. He was a state representative and later a state senator before his election to the U.S. House in 1958. Rostenkowski was a pillar of the Chicago Democratic Machine -- a ward committeeman whose precinct captains were experts at getting out the vote. He once said that in Chicago politics is "a blood sport." Until the end, he never faced more than token political opposition. As Ways and Means chairman, he handled the job in old-school fashion, once telling an Associated Press interviewer that those who crossed him legislatively "should not expect any largesse, so to speak, from me." But he believed in compromise and expressed dismay at the partisanship that descended on Capitol Hill after he left. He was fond of closed-door meetings where political dramatics were shelved in favor of deal making. "We looked at politics as compromise," Rostenkowski said. "We were going to work together. We were going to get something done. We were Democrats and Republicans but we were also legislators. Politics is war today. Everybody wants to fight. Nobody wants to give in." "As much as people criticize the back room, the dark room or the cigar or smoke-filled room, you get things done when you're not acting," he told an interviewer. In his day, he said, "we'd argue like hell on the floor of the House of Representatives but we were out playing golf that night." He had little use for rules limiting contacts with lobbyists. "If a congressman is going to be a rascal he's going to be a rascal," Rostenkowski once told an interviewer. Rostenkowski brought in millions of federal dollars for public works projects, including turning Navy Pier on Chicago's downtown lakefront into a recreational area. "He probably did more for Illinois and for Chicago in particular than any person that's ever represented the state," said former U.S. Sen. Alan Dixon, whose friendship with Rostenkowski dated to 1951, when both were state lawmakers. As chairman, Rostenkowski opposed protectionist trade legislation and played a key role in pushing through the North American Free Trade Agreement, which lowered trade barriers between the U.S., Canada and Mexico. Never a favorite with liberal groups, Rostenkowski joined forces with many corporations to win approval of the measure, which was proposed by the Clinton administration but bitterly disliked by organized labor. Rostenkowski won praise for driving the 1986 tax overhaul legislation. In a dramatic gesture designed to focus attention on the issue, he went on national television and urged viewers to write to him with their own views on how the nation's tax laws could be improved. He told them that if they had trouble spelling his name, all they had to do was "write Rosty" in Washington. The bill then-President Ronald Reagan finally signed into law eliminated numerous loopholes. "I think the epitaph I'd like to see, even on my gravestone, would be, 'He wrote good law,"' Rostenkowski said later. "That it was fair."